The Holy Communion is celebrated in Christ Church, Taney, on Wednesdays at 10.00 a.m.
During term time, toddlers and young children are very welcome in the Crèche in the Minor Hall, Parish Centre during 10.15 services unless otherwise notified in our News Update section. We have a Service of Holy Communion on Wednesdays at 10.00 am in Christ Church, Taney, at which we remember all who are sick or suffering by name, and our prayers and sympathy are with all those who are bereaved. You are most welcome to take part in these services with us. Coffee is served in the Parish Centre following the service. For children wishing to remain in the service there are Children's Packs available in the church porches. Please see the relevant section in the main menu 'Church Services'. 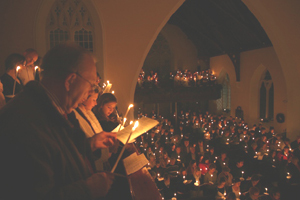 A number of special services are held throughout the year. For information on these please keep an eye on the NOTICEBOARD.